This is the second book in the Best Walks in Canberra series, following on from the second edition of Canberra's Best Bush, Park & City Walks. 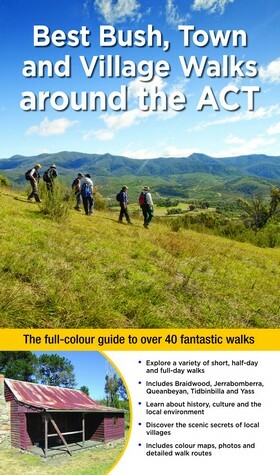 Best Bush, Town and Village Walks Around the ACT offers more walks away from the centre of Canberra, with the added bonus of walks in towns and villages across the border. Canberra is the best served of any city in Australia for walking; its suburbs are criss-crossed by sealed pedestrian/bicycle paths which are easily accessible, while the numerous hill and mountain tops are nature reserves with management road access and/or defined walking trails. This book contains over 200 kilometres of walking in parks, alongside waterways, up hillsides, and through nature reserves and bush land. Many walks feature spectacular views or are interesting because of the variety of wildlife seen. The bush walks vary from walks through grasslands or woodland, up mountainsides, along river banks and past gorges. Some walks feature historic buildings and monuments, others highlight the history of the region both before and after European settlement. Marion Stuart has been a teacher in Canberra for many years. Born in Canberra with family in the area, she grew up with an understanding of early Canberra and the history of the region. However, researching and writing this book has given her another perspective altogether. Many of the walks for this book were first completed as a young girl – some have changed dramatically, and others seem virtually unchanged, except for signage and a better defined path. This book has been a discovery tour for her, as hopefully, it will be for others.